Lydia, Dean and Robyn don’t know one another. Yet. Each is facing difficult challenges. Lydia is still wearing the scars from her traumatic childhood. Wealthy and successful, she leads a lonely and disjointed existence. Dean is a young, unemployed, single dad whose life is going nowhere. Robyn is eighteen. Gorgeous, popular and intelligent, she entered her first year of college confident of her dream to become a pediatrician. Now she’s failing her classes. Now she’s falling in love for the first time. Lydia, Dean and Robyn live very different lives, but each of them, independently, has always felt that something was missing. What they don’t know is that a letter is about to arrive that will turn their lives upside down. It is a letter containing a secret—one that will bind them together and show them what love and family and friendship really mean. 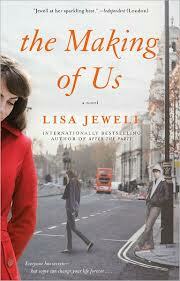 The Secrets of Us by Lisa Jewell is a novel about finding where you belong. It follows three characters that lead vastly different lives but always felt a piece of the puzzle missing and when they eventually find it, they find their way to each other. Although this novel is relatively easy to read, I found myself unable to connect with the characters and unfortunately remained ambivalent throughout. This novel started interestingly enough, back in the 70's with a woman who can't conceive and wants to try what I presume was some of the first rounds of artificial insemination. I was completely captivated at that point and wanted to see this women's journey, how she's deceiving her husband and read about the process back when it first began. But we're kicked to the present day and never see the story from this woman's perspective again, which confused me as it wasn't even a prologue, but a section based on her name so I expected to flip back to her at some point. I also really enjoyed that this novel provides something different to read about, rather than the same old story. I found myself unable to connect to any of the three main characters. Initially, I found it difficult to keep track of who was who with the alternating narrative, and then once I had that sorted, I still couldn't find much to grab hold of. They were all very lonely people and spent a lot of time up in their heads, which is normal for many, but I've found myself bored lately with books like this. I want action instead of characters running around with their thoughts. That's not to say there wasn't any interaction. There was, but I found it lacking somehow. Robyn was by far my favourite - possibly because she was the warmest, most down to earth, character - or maybe because she had the most positive attitude and support group, so she had many people to interact with - or maybe because I was most intrigued by her predicament and it made me wonder about others in the same situation. It wasn't that Jewels' writing is bad - quite the opposite. It was easy enough to read, but I just kept finding myself drifting many times, unable to focus on the book. There were a few things that kept me interested with each character, probably why I kept reading, but over all I didn't find it the most enjoyable read. Many others loved this one though, so maybe it's just my personal preference about action packed novels. Maybe I have novel attention span disorder. I would definitely try another Lisa Jewel novel though, as she has published many!